F41 produces a large, white, dense mushroom with a well rounded cap of 40-60 mm across. This strain has an extremely high picking rate and is most suited for growing large closed mushrooms for the fresh-market. F41 has some tendency for scaling on the first flush. F41 requires a homogeneous active not dry compost. At cropping take care to have a good temperature difference between air- and compost temperatures. Avoid high air-velocities at cropping and preferably do use supplements at casing. The first picking at 12 to 13 day’s after aeration. This strain likes nutritious, well-degraded compost with relatively high moisture content. Too dry and inactive composts will result in a dramatic reduction in yield. Compost density and filling-weight at about 90 to 100 kg per m at spawning. For this strain compost has to be free of ammonia at spawning. Recommended spawning-rate is 5 to 7 litres per tonne of fresh compost or about 8 litres per tonne through spawning. 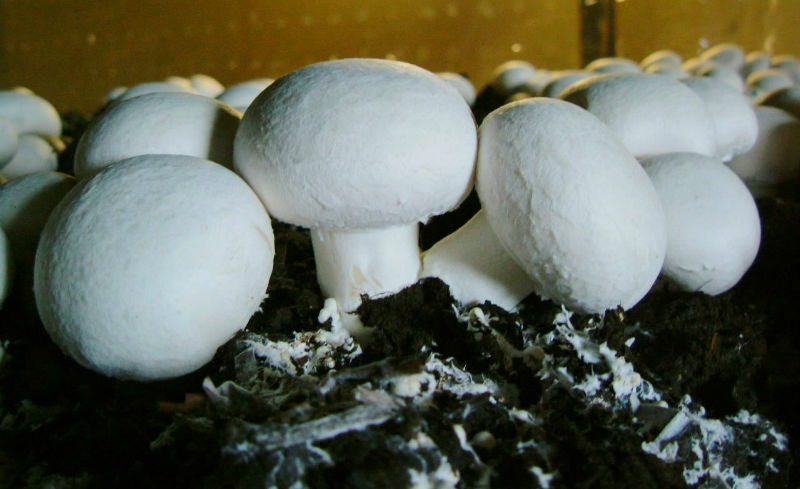 After spawning the myceliumgrowth is not very vigorous for the first 8 to 10 days, but improves rapidly after 12 days and shows a normal pattern of growth after casing. The optimal incubation period is 14 to 16 days. Avoid temperatures over 29°C (84 °F) in the compost and do avoid drying of the compost at this stage. F41 reacts very positively to supplementation at the moment of casing with a rate of 1 kg per m2 . Without supplementation pin setting and pingrowing may not come up to expectations. Also the quality and shelf life of the fruit bodies will be improved by the addition of supplements. This strain likes a casing-soil with a high water content and a coarse lumpy structure. F41 also responds well to Cac’ing. For handpicking the depth of the casing layer should be about 5 cm (2 inches). At casing about 400 gr. spawn runned compost or 100 gr. CMS per m can be mixed into the casing soil.With this method of cac’ing a more wet casing soil should be used because less days for watering are available. Stop watering at least one day before aeration. This strain can also be grown with the system of scratching at about 7 days after casing. It is not necessary to reduce the temperatures fast and low for this strain. Ideal is to end up with an air-temperature of 17°C and a compost temperature of 19,5 °C at about 4 days after the start of aeration. Keep relative humidity high at 92% or higher and the CO2 – content over 1000 ppm. It is important to keep temperature difference as wide as possible by low air-volumes and a high humidity in the micro-climate. Not all pins should be formed at the same stage. For optimal production and quality the relative humidity should gradually be lowered, at high CO2 contents 6 to 7 days after the start of aeration. This results in a more dispersed appearance of the first flush and improved size and picking-rate of all flushes. Commence watering when the fruit bodies have reached more than pea-size about 3 days before the first real picking. Avoid compost-temperatures over 21 °C until 75% of the yield of the first flush has been picked. At the last picking day re-water the casing soil and increase air-temperature, relative humidity and CO -content for re-pinning as shown in growing proposal. For this a good compost activity, a moist casing soil and a good temperature difference is important. Increase the air temperature at the end of the second flush to bring the compost temperature up to 21 °C while keeping a high relative humidity and CO in the air for a short while. After this lower the air-temperature, relative humidity and CO for improving the evaporation to encourage the pin growing of the third flush.